The following Schools have announced full closures or late opening times due to the adverse weather being experienced over the next few days (1st Febuary 2019). due to the continuation of snow fall. due to the continuation of snow fall. School will be closing at 12.30pm due to the continuation of snow fall. Please collect your child from reception (as this morning). The turning circle is out of use. Regretfully, the school is closed today. We apologise for the inconvenience we know this causes. This is to ensure the safety of everyone given the hazardous road conditions on everyone’s route to school. Due to the continuing snow we will be closing at 2pm. Children can be collected earlier if necessary. Please collect from the front playground at 2pm. All clubs and the clothing sale have been cancelled. The College is currently closed due to heavy snow weather, the College do not wish to put students or staff at any risk. Unfortunately, the school has decided to close due to harsh weather conditions. They apologise for any inconveniences made. Due to adverse weather conditions and for the safety of our Staff and Pupils travelling the decision has not been taken lightly to close the school today. We are very sorry for any inconvenience caused. We have made the difficult decision to close the school due to an assessment of the school site and the safety of pupils, parents and staff. We are sorry for any inconvenience this may cause. Due to the snowfall overnight, we have decided to cancel lessons for Friday 1 February. Students should log into Google Classroom/OneFile to complete work set and continue to work on assignments. Do not attempt to travel to college. The online exams scheduled today will take place, so please come into college for these if you’re able to travel safely. The BCoT Nursery is also closed today (Friday 1 February). The school will be opening at 10 am – we will continue to monitor the situation and will update if any change. The preschool will stay closed today due to snow. Have a fun day with your little ones. Due to harsh weather last night, the school has decided to officially close. Clatford Primary School apologise for any inconveniences made. Due to adverse weather conditions and in the interest of the safety of both pupils and staff the school will be closed today, Friday 1st February 2019. Due to the revised weather forecast and snow the school will be closed today. Due to staff shortage and increased snowfall we have had to close the school. Apologies for any inconvenience caused. Since 6.45am this morning there has been a change in the forecast and snow is expected in Andover for the rest of the morning. As a result we have made a decision to close the school. Staff will be on site look after students that have already made there way in. Apologies for the late notice but the weather forecast has changed in the last hour. The Year 11 Health and Social Care exam will go ahead as normal. Many apologies but Hatherden will have to close today due to low staffing levels, no school lunches and the risk to community safety on the roads. Unfortunately, our school website has also decided to crash at the same time so we are unable to inform parents via this route or put up any work for children. Due to the overnight snow fall and after a check of the surrounding site by the Health and Safety Officer a decision has been taken to close the school. The decision has not been taken lightly, of paramount importance is the safety of students and staff both in terms of moving around the school site and journeys to and from school. The school will be open as normal on Monday. Due to the overnight snow, the difficult decision has been made to close the school today. We apologise for any inconvenience. The school is closed today due to the inclement weather. This decision is not taking lightly, but after considering the safety of all our pupils and staff, many who have long journeys to get into school. Our Nursery and School will be closed today as we are unable to staff the setting as required to ensure pupil safety. Thank you for your understanding. Due to the adverse weather conditions and to ensure the health and safety of all the children and staff we have made the difficult decision to close today. Please take care and we look forward to seeing you on Monday. 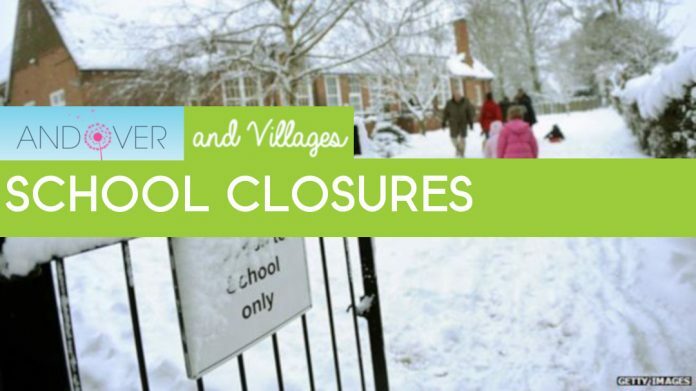 Due to overnight snow and after the school and surrounding area checks, it has been decided to close based on the health and safety for all children and staff. This decision has not been taken lightly. The school will reopen on Monday 4th February as usual. Due to adverse weather conditions and for the safety of all pupils, parents and staff, we have take the difficult decision to close the school today. With the scheduled INSET day on Monday 4th February, school will reopen for pupils on Tuesday 5th February. Due to adverse weather conditions the College will open late today. Lessons will start at 10.40 am. Please only travel if you consider it safe to do so. Too unsafe for staff to travel the long distance to school. The school will be closed today for staff and pupils. St Mary Bourne Primary School is closed due to heavy snow and weather. Due to the adverse weather conditions and the prediction of more snow in the area we have taken the decision that for the health and safety of pupils and staff not to open today. School closed today due to adverse weather conditions. Please check school website for further updates. Owing to the weather and the roads around the school, we are concerned for the health and safety of travelling to and from the school today. Therefore, it is with regret that we have taken the very difficult decision to close the school for the day. We apologise for any inconvenience this causes any of our school community. Wellington is closed today due to the weather. Sorry for the inconvenience, stay safe and have a lovely weekend! Whitchurch CE Primary School will be closed today due to snow, ice and adverse driving conditions making travel unsafe. The health and safety of pupils, parents, staff and visitors is our priority during this period of inclement weather. We will see you all on Monday. The school is closed today due to the inclement weather. The decision is not taken lightly but after considering the safety of all of our pupils and staff many who have long journeys to get into school.